Information on how to get the Mysterious Box and what to do with it in Destiny 2. Destiny 2 players have been asking how to get the Mysterious Box and what to do with it following the launch of the Black Armory expansion. If you purchased the latest Annual Pass for Destiny 2, the Mysterious Box will be available for you to find. Once you’ve located the Mysterious Box, you can then use it to obtain the Izanagi’s Burden Exotic sniper rifle. This weapon is extremely valuable, especially if you plan on taking a stab at the complex Bergusia Forge puzzle. It’s worth noting that you no longer need to solve the puzzle in order to gain access to the Bergusia Forge. Of course, if you’re interested in a challenge and want to earn a special Ghost and Emblem for your trouble, the Bergusia Forge puzzle can be a fun side activity. To help get an item key to the Bergusia Forge puzzle, you’ll first need to find the Mysterious Box and use it to obtain the Izanagi's Burden Exotic sniper rifle in Destiny 2. The Mysterious Box can be found in a cave outside the entrance to Volundr Forge in Destiny 2. The first thing you’ll need to know about the Mysterious Box is how to get it in Destiny 2. Located near the entrance to Volundr Forge in Destiny 2’s EDZ, you can easily pick up the Mysterious Box and in doing so, begin the quest line attached to it. Having a hard time finding it? Start near the Sunken Isles, then follow the nearby tunnels to Volundr Forge. Once you arrive at the entrance to Volundr Forge, head left and jump down onto a platform. Next, jump down again to reach a hidden cave. Explore the cave and you’ll find a Supply Cache, and inside this Supply Cache is the Mysterious Box. Studying the Mysterious Box, you’ll notice it has four different locks. By unlocking all four of these locks, you’ll be able to get your hands on the Izanagi’s Burden Exotic sniper rifle. What’s nice is the first three locks (Hand, Butterfly, and Fishhook) can be opened by shooting drones for Maximum Temper within the three Black Armory forges: Gofannon, Izanami, Volundr. 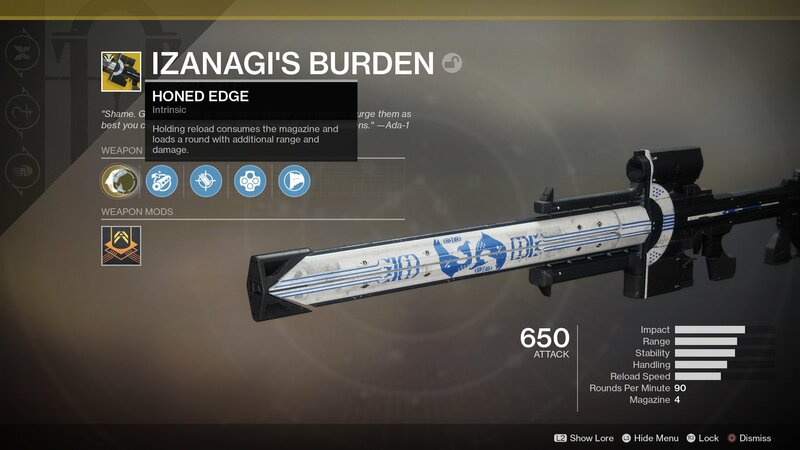 By unlocking all four locks on the Mysterious Box, you'll be able to obtain the Izanagi's Burden Exotic sniper rifle in Destiny 2. Seeing as how you obtain the Mysterious Box near the Volundr Forge, you can begin the process by shooting drones at Volundr Forge. For the final lock, you’ll need to pay a visit to Ada-1 and obtain the Black Armory Key Mold quest. There are several steps to the Black Armory Key Mold quest including clearing the Bergusia Forge with Maximum Temper (acquired by shooting drones in each Black Armory forge). Other steps require you to obtain a Glimmering Amethyst, complete the Shattered Throne dungeon, complete a Black Armory Bounty of Rare status, complete a special version of Bergusia Forge, and complete a special version of The Pyramidion Strike. With all of these requirements met, you can return to Ada-1 who rewards you with the Izanagi’s Burden Exotic sniper rifle. Even though the process of obtaining this weapon is tedious, many feel it’s well worth the effort. 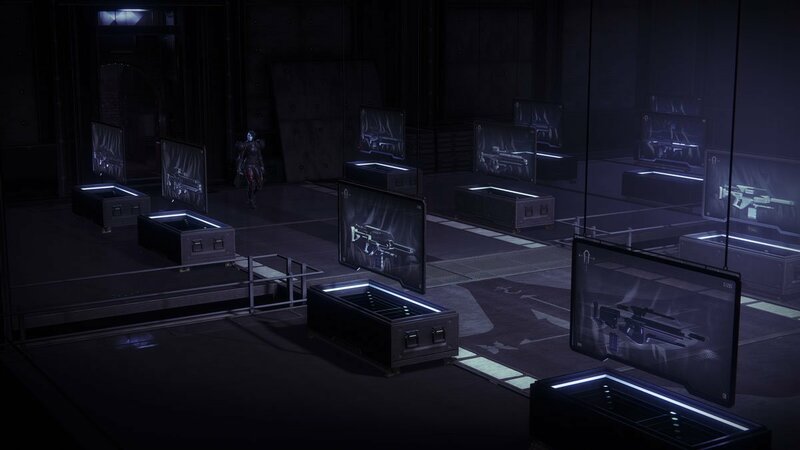 Now that you know where to find the Mysterious Box and how to unlock each of the four locks, what part of the Black Armory Key Mold quest are you looking forward to the least? Alternatively, if you’ve already completed everything, what was the easiest part of the quest? Let us know down in the comments below! For more on Destiny 2, be sure to check out some of our previous features including where to find Xur in Destiny 2 during the week of January 18, how to get the Wavesplitter in Destiny 2, and where to find Wanted: Gravetide Summoner in Destiny 2. By reading through this guide, you should now know how to get the Mysterious Box and what to do with it in Destiny 2.